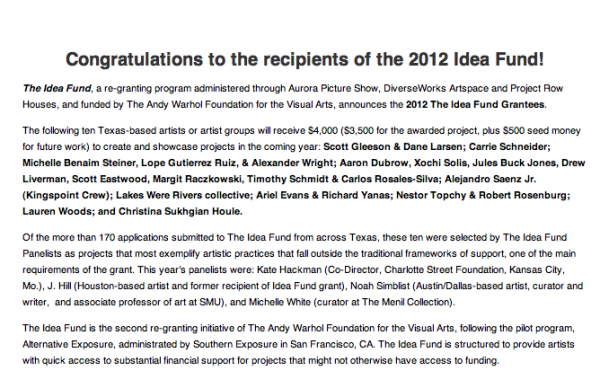 Idea Fund Grantees announced | Michelle Benaim S.
The Idea Fund provides cash awards to up to 10 artists, associations of artists and/or curators that create and showcase new work that involves the public via process, production, or presentation. The Idea Fund will accept proposals from artists/curators focusing on the visual arts, performance, film, video, new media, social practice, and interdisciplinary projects. Projects may include an exhibition or exhibition series; a public art project; a one-time event or performance; the ongoing work of a collective, collaborative, or artist space; an online project or publication; an artist residency; a series of screenings; and more. 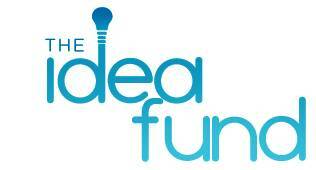 The Idea Fund seeks to support new works with the resulting project activities accessible and presented to the public. 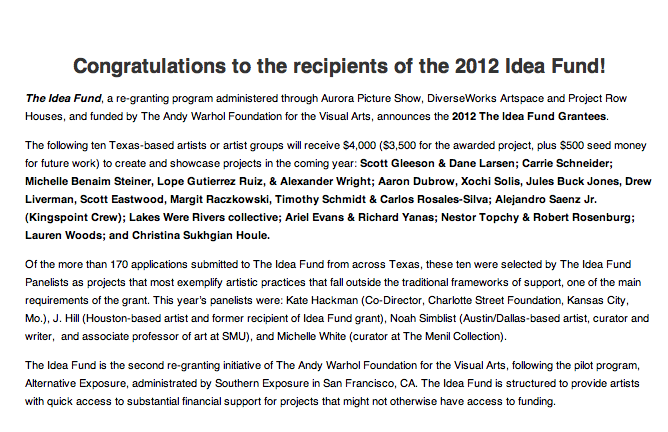 The “Fund” of the Idea Fund is supported by the Andy Warhol Foundation. They aim to support projects that are innovative, and in some ways, the kinds of projects that are not supported by traditional grants funding. Anyways, I’m very proud to find my name listed next to so many others whose work I admire.